Over the past month I have been engaged in discussions on the importance of inclusion in sports for people with disabilities. As these discussions are going on I have listened to my contemporaries explain how we need push inclusion in sports for people with disabilities. This is something I am in totally agreement with. However, as discussions continued to go on I was hearing arguments allowing people without disabilities to participate in wheelchair sports. Not only at the grass roots level but at the Paralympic level as well. I had a friend of mine explain to me that he wanted his brother to push in a track chair with him so that they can participate in a marathon together. The organizers of the event did not allow this to happen due to their policy. I am not sure what their policy states. It was probably something in regards to safety, unfair advantage or just not appropriate. Whatever the reasons, I understand but there is room for discussion on this topic. As a person with a disability for about 35 years I have participated in many activities that included people without disabilities. It wasn’t until I was 20 years old that I had my first experience of structured programs in wheelchair sports. As I continued to develop my wheelchair skills, I knew that the level of competition would increase as well. The more I trained and participated the more athletic I began to feel and the more competitive I wanted to be. 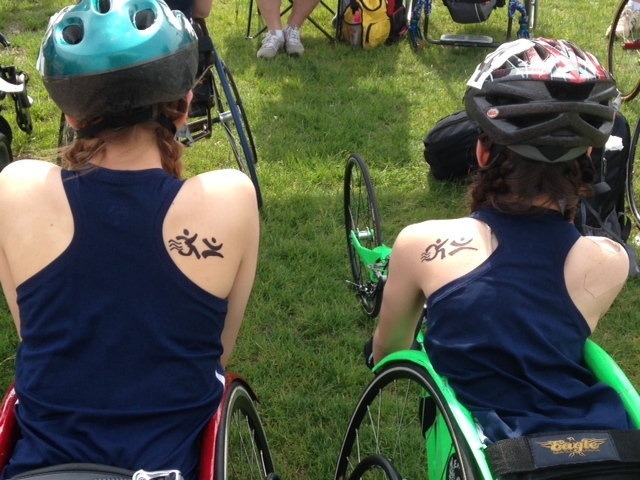 Because of the unique style of participation in wheelchair sports it is easy to feel that it can only come from people with disabilities. Of course my opinion is completely subjective, only people with disabilities can play wheelchair sports, because they are the only ones who could make the sport better. Right? Maybe? Over the years, as I have developed my skills to a Paralympic level, I felt that it is imperative that people with disabilities become viable in our nation as a sport entity. Economically viability is what gives a minority group power in our world. Living in a capitalistic society we do place a value on having economic viability. But that idea can easily be compromised when we undermine the very nature of the goal we are trying to reach. What is it that people with disabilities want? We want inclusion! We want to know that in the USA every school, community center, fitness center, recreation program, sport event and every public facility has the universal design concept and 504 acceptance for people with disabilities. Basically, we want inclusion for all, nothing about us, without us. Right? So, with this being the goal isn’t in the best interest of inclusion that all people without disabilities be allowed to participate in not only recreation endeavors but competitive ones as well? How can one say we want inclusion but only for a few? What does that say? In regards to competitive participation in a marathon it seems that if an Inclusion category was added to any race this would allow a person without a disability to participate in the event using a track chair. There are existing wheelchair sports or sports for people with disabilities, in which people without disabilities are competing, wheelchair basketball and goalball. At the end of the day, if all sport events were inclusive then we would not have to create this inclusion category. Now, this is really something I would be in total agreement with. What about you? Will do, thanks for getting back to us.